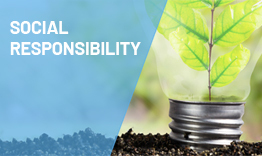 At TC Transcontinental, our desire to contribute to the development of sustainable business practices is firmly rooted in our values. The company is committed to maintaining its leadership in corporate social responsibility by deploying efforts to pursue its business activities in a responsible manner. To view TC Transcontinental’s story around sustainability as well as its publications, reports and policies, click here. The manufacturing activities as part of the Advanced Coatings team include chemical storage, coatings manufacture, coatings application and waste disposal. In order to ensure that the best available techniques are used to protect the environment, all these activities are regulated under Pollution Prevention and Control Regulations. To minimize any risk of polluting local water courses, our activities are also subject to stormwater and waste water regulations which are enforced by local authorities. As we drive our development of excellent services and quality products, we are very conscious of our responsibility towards the local community and the environment as a whole. We have therefore thought carefully about how our activities could potentially affect the environment and what steps we need to take to minimize any impact. Transcontinental United Kingdom has worked in partnership with the North Wales Wildlife Trust to develop and promote a wider living landscape scheme within the Wrexham Industrial Estate zone. The living landscape scheme is a recovery plan for nature driven by thoughtful business land management to benefit wildlife, people and the local economy. Land and habitat restoration work on site will improve our green infrastructure and enhance long-term biodiversity of wildlife in the locality. Our support of the Wildlife Trust on this sustainable development project will benefit a number of wildlife species, including the rare Grizzled Skipper butterfly, a species which has seen a sharp decline in numbers due to the spread of inhospitable landscape due to poor local land management. One of our main activities is the application of solvent-based coatings to produce coated products. These solvents have to be dried off by evaporation and could potentially contribute to global climate change if they were allowed to go into the atmosphere. We therefore take great care to ensure these solvents are removed. The solvents are destroyed by oxidation in regenerate thermal oxidizers that we have on site. The job of the oxidizers is to burn any solvents and stop them from going into the atmosphere. We have instruments that continually monitor the solvent emissions from the oxidizers. These emissions are regularly checked to ensure the strict emission limits imposed by our operating permits are complied with. The energy we use is a major contributor to our overall environmental footprint. We purchase natural gas and electricity to manufacture our products. These fuels are also required to operate the regenerative thermal oxidizers used to control and minimize our air emissions. We do not use use drains on site to dispose of any liquid effluent emissions. All process waste is removed from site by authorized contractors and re-processed or disposed of in an environmentally responsible manner. All liquid solvent waste is collected in drums and is often re-used as fuel by other industries. The company takes measures to ensure that all chemicals are properly stored and handled in a way that avoids the risk of spills or land contamination. We recycle waste whenever possible. This includes recycling paper, plastics, steel, wood and silver. Additionally, the Transcontinental United Kingdom facility complies fully with its obligations under UK law in respect of recycling targets set for packaging waste by the UK government. These targets apply to all packaging used by the facility to pack its own products, and also to all packaging brought in the UK around imported goods such as raw materials. The targets set by the UK government for the main packaging materials are currently as follows: paper 69.5%, plastics 37%, steel 72% and wood 22%. Plastics recovery is set to increase at the rate of 5% p.a to 2017. We continuously monitor our performances and report required metrics to local and federal authorities regularly and upon request. As part of TC Transcontinental now, our sustainability metrics are also reported on a monthly basis to the Corporate Social Responsibility team at Transcontinental head office. If you would like to get in touch about Sustainability please contact us.